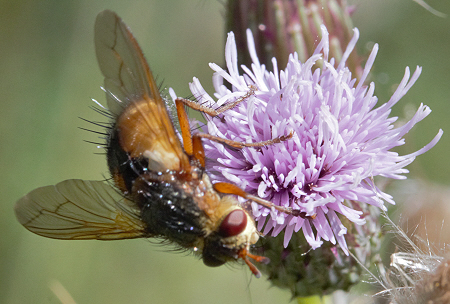 Thick-headed fly Physocephala rufipes on creeping thistle. Photo © Michael Rumble. July 20th 2011. 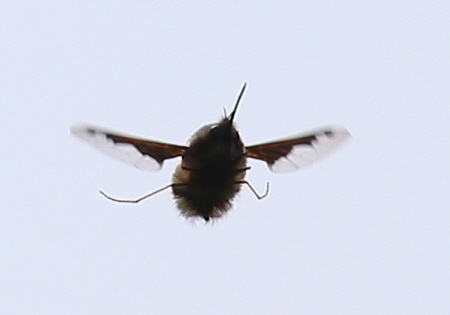 Bee-fly Bombylius major hovering. 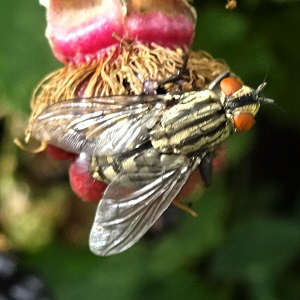 This is a harmless fly and the sting-like projection at the front is part of the mouthpart which it uses to probe nectar from flowers. Something similar to the way a humming bird feeds. 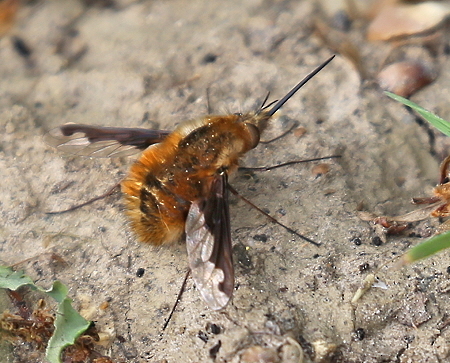 Bee fly Bombylius major. 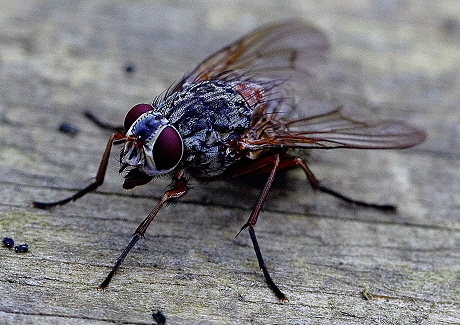 Despite its appearance it is a harmless fly. 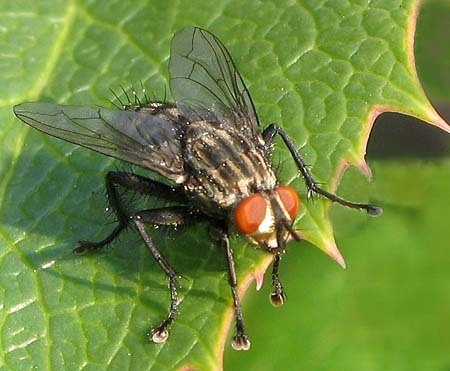 Often one of the earliest flies to appear in the spring it seeks a piece of bare ground or a dead leaf on which to sun itself. 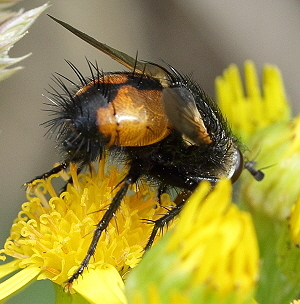 Feeds on pollen and nectar. 13th May 2016. Photo © Colin Carron. 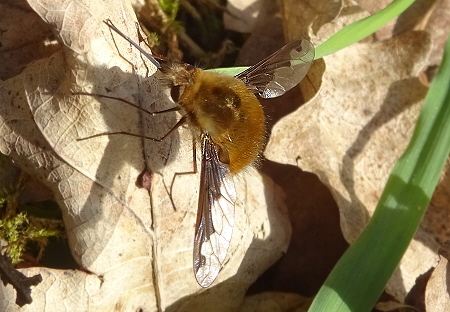 Bee-fly Bombylius major. 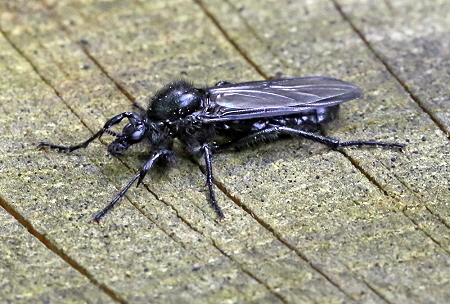 A harmless fly which enjoys the sunny days in early April, usually resting on dead leaves. Common in the South.3rd April 2017. Photo © Raymond Small. Identified with thanks by Tony in the Bug Forum of The Natural History Museum's NaturePlus team. Photographed on the back of an English oak leaf on 6th September 2015 © Brian Ecott. 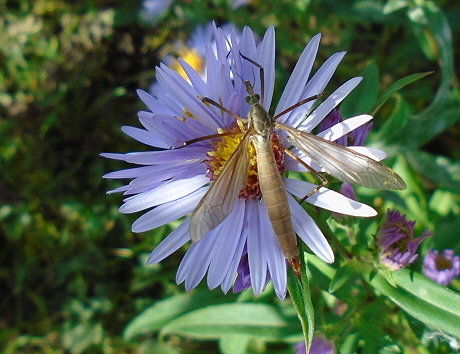 Common cranefly Tipula paludosa female on Michaelmas daisy. 9th October 2016. Photo © Raymond Small. 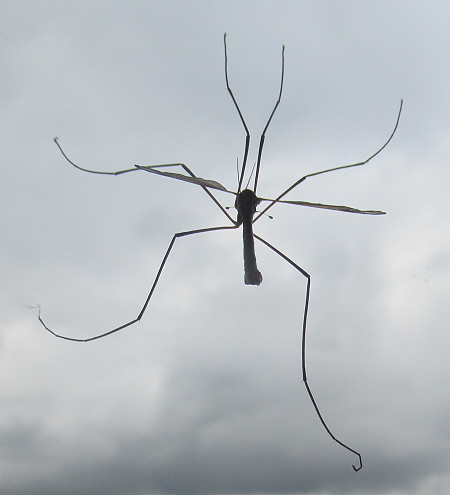 LEFT: Cranefly on Global café window. 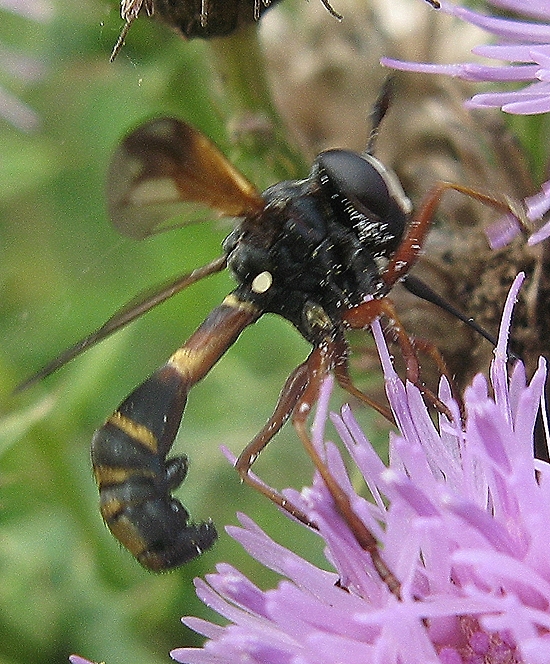 The picture above - a body close up shows two club shapes organs which are replacing the second pair of wings lost in evolution. 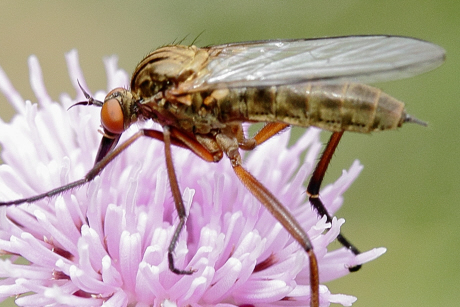 In two winged flies (Diptera) the halteres provide a means of encoding body rotations of yaw, roll and pitch during flight. 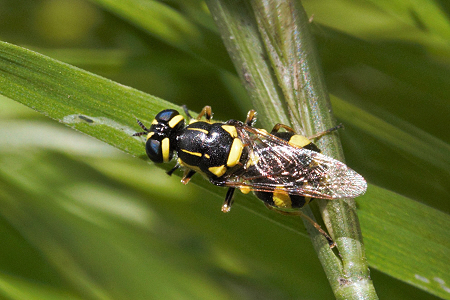 This enables the insect to make corrections to enable a smooth flight. the surface water film by means of a breathing tube. 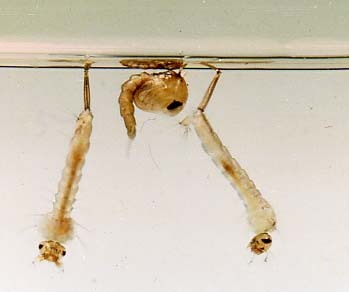 The pupa is between the two larvae. 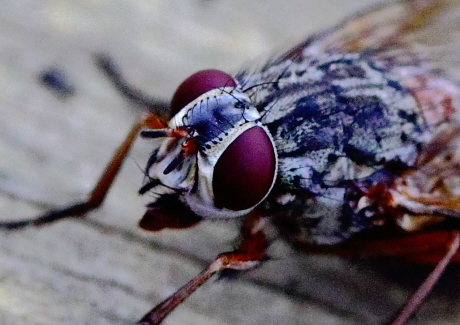 St. Mark's fly Bibio marci pair. 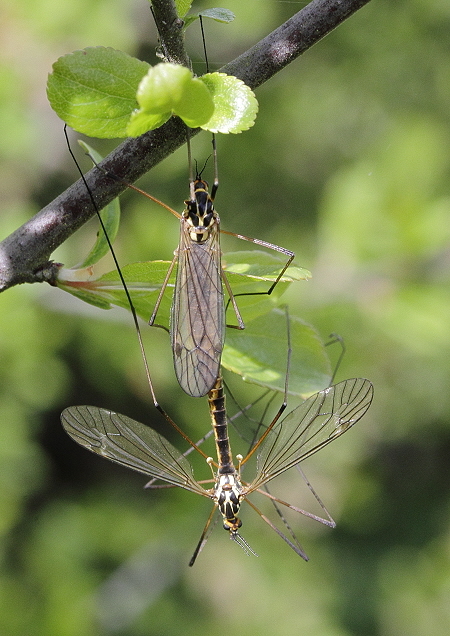 These long-legged flies appear around the time of the Feast of Saint Mark (25th April) hatching from over-wintering larvae in the grassland. Photo © Michael Rumble 4th May 2015. Saint Mark's fly Bibio marci. 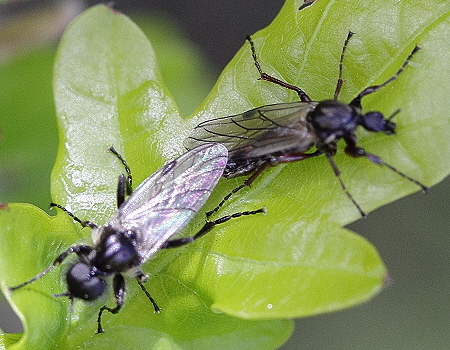 On still days these black long legged flies swarm around the young oaks. 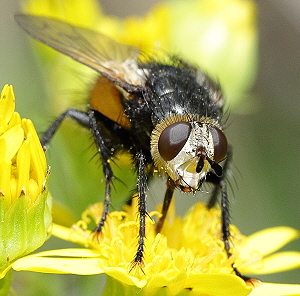 They were named after St.Mark's feast day 25th April when the flies were said to appear. A variable date - 13th May 2016 this year. Photo © Colin Carron. 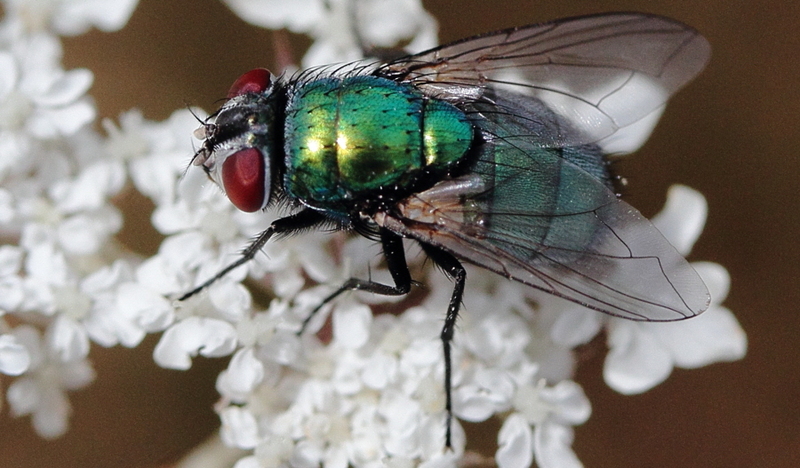 Greenbottle Lucilia caesar is old and has developed a bronze colour. 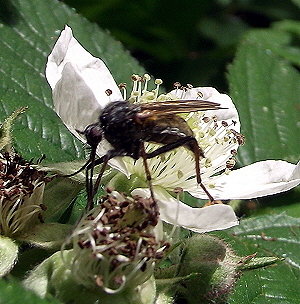 Flesh fly Sarcophaga sp. 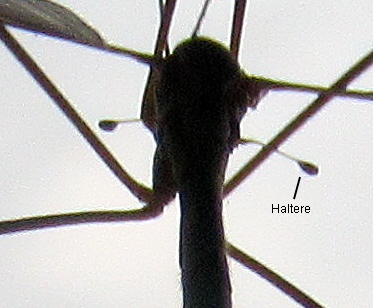 The red eyes are wide apart denoting a female. With males eyes almost touch. 3rd November 2015. Photos © Michael Rumble. 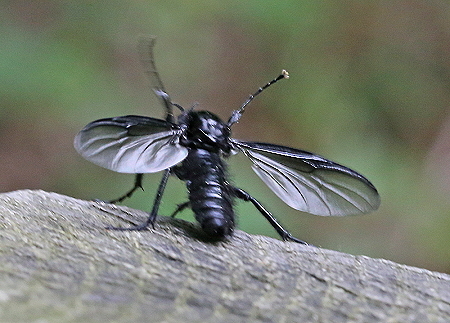 Fly Graphomya maculata Female. Hoghill. 6th August 2012. Sexually dimorphic species. 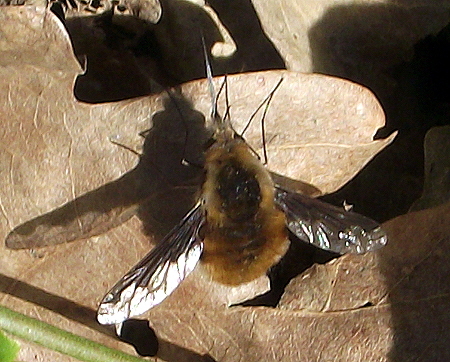 Male has yellow wings and abdomen. Black snipe fly pair Chrysopilus cristata. 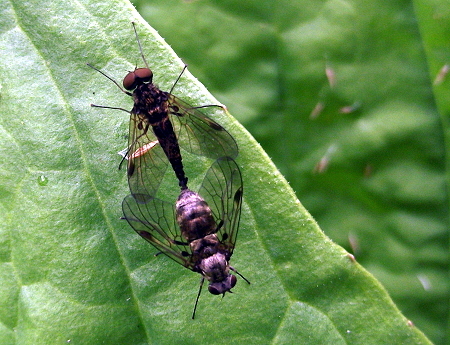 The pair are sexually dimorphic. 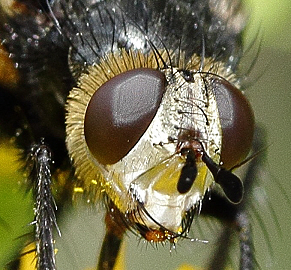 In the male above the eyes are touching on a large head and the black body tapers, whereas the female is patterned and the eyes set apart. 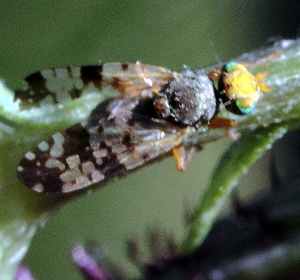 Prominent stigmata are seen on each wing. Identified by "Laverlock" at the Natural History Museum Bug discussion group. 27th July 2015. 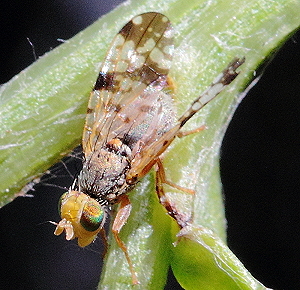 Soldier fly - Four-barred Major Oxycera rara (female). 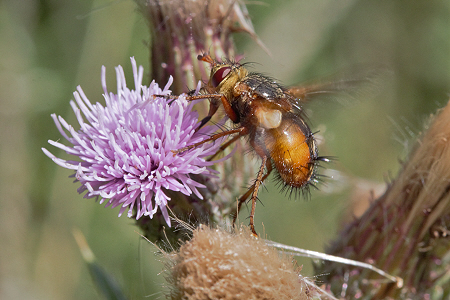 With thanks to Del Smith, Dipteran Recorder, Essex Field Club for the identification. On grass stem at Sheepwater. 19th July 2015. Photo © Michael Rumble. 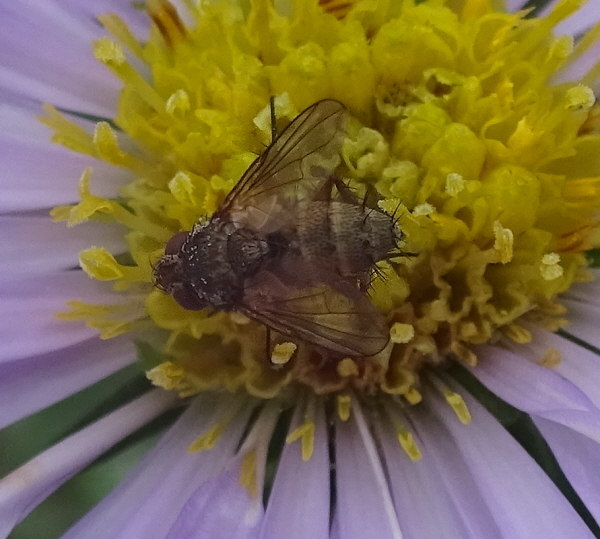 Tachinid fly on Michaelmas Daisy. Photo © Raymond Small. 24th October 2017.